I’m thrilled to be able to teach and share my knowledge with you. Growing your own organic food in an urban setting can significantly change your health and way of life. I will be providing full and partial scholarships for those of you who are interested with limited funds. Please note, this series is on basic organic vegetable gardening. 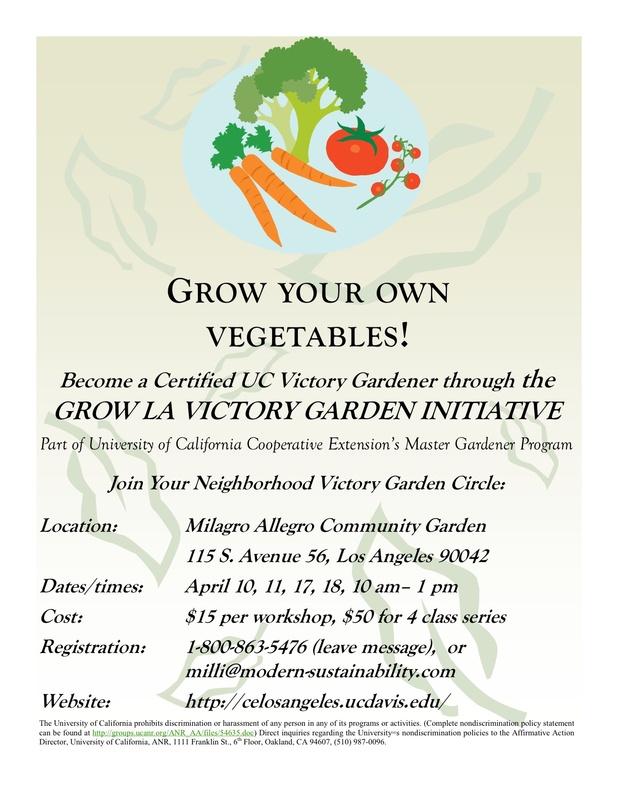 You must attend all four classes in the series to become a UC Certified Victory Gardener. After the series is over, we will attempt to meet informally to share our gardening experiences and have a chance to ask and answer questions. Limited to 20 people. Spanish translation will also be available. Seeds, seedlings, soil and plastic pots will be provided. For more information, please contact me. 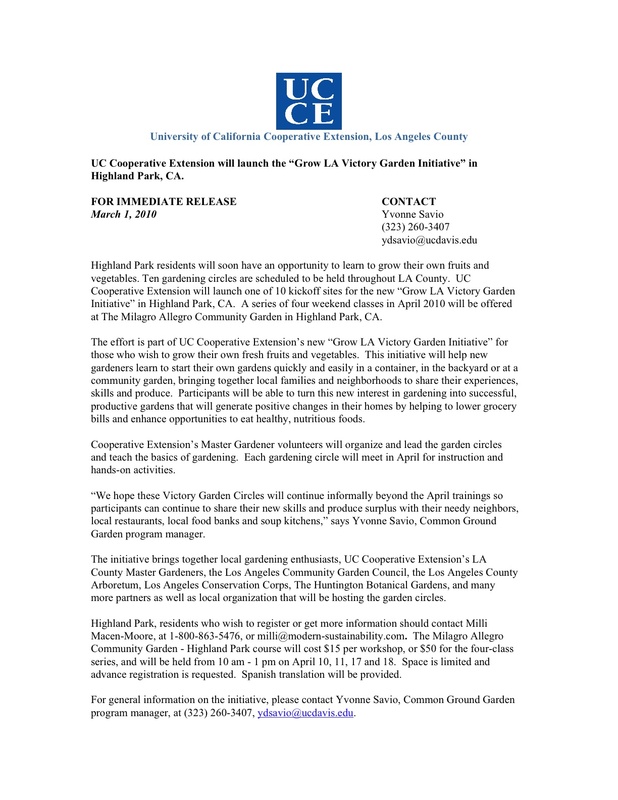 Looking forward to a successful Grow LA Victory Garden Initiative! PopTech 2009: Michael Pollan from PopTech on Vimeo. Keynote Speaker, Milli Macen-Moore: 7th Congress 50% Food Initiative, March 20th! Will be estatic to see you there! Hola all! Hillside Produce Cooperative is at it again, redistributing homegrown veggies, herbs, and flowers! Check out the 411 below! WELCOME BACK, everyone and happy 2010! So what do you do if you’d like to join in? and let me know what produce you’ll have to contribute this Saturday and/or if you’d like to volunteer to bag or deliver all the amazing food! To include you in this Saturday’s exchange, I’ll need to hear back your commitment to participate via email by this THURSDAY (February 11th) at NOON. As always, participants will drop off their yummy harvests at my house in Glassell Park – this Saturday, Feb 13th before NOON, bagging volunteers will be needed to count everything and redistribute it equally at NOON, and the beautiful savvy delivery volunteers will be needed at 2:30. Also, if you’ve never exchanged with us before, I’ll need your address so someone will be able to deliver a big farmers’-market-style lush bag of FREE produce to your door. It’s been so difficult to watch all our gorgeous citrus dripping off the trees the last couple of weeks! But now we’re back in action and ready to share. The Hillside Produce Cooperative is a free neighborhood monthly exchange of all the FRUITS, VEGETABLES, HERBS and FLOWERS we grow in our yards; a collective in which we all get to enjoy some of what everyone grows in exchange for contributing what we don’t want or won’t use ourselves. Then no food is wasted and we all get a variety of fresh local produce to eat for FREE. Will we survive another round of Settler’s Venture, I’m confident we will. At this point we have an overabundance of food… some of you may be thinking, what in the world can these people be making with this? How about homemade pizza, portabella burgers & fries, daily smoothies, stir fry, soups, salads, cabbage rolls, bread, chana masala & naan, sushi, and the list goes on… Our focus still continues, BACK TO BASICS! Summer seedlings enjoying a warm bedroom. We keep harvesting every two days!!! We have edibles growing everywhere! We had a happy visitor this morning… He’s ready to go home and prep a salad! Below is this week’s movie recommendation. Enjoy! 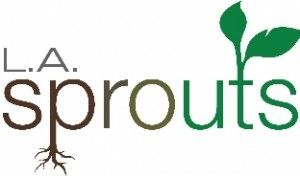 Can’t wait to listen to your opinions regarding this incredible family growing their own food in Pasadena, California. 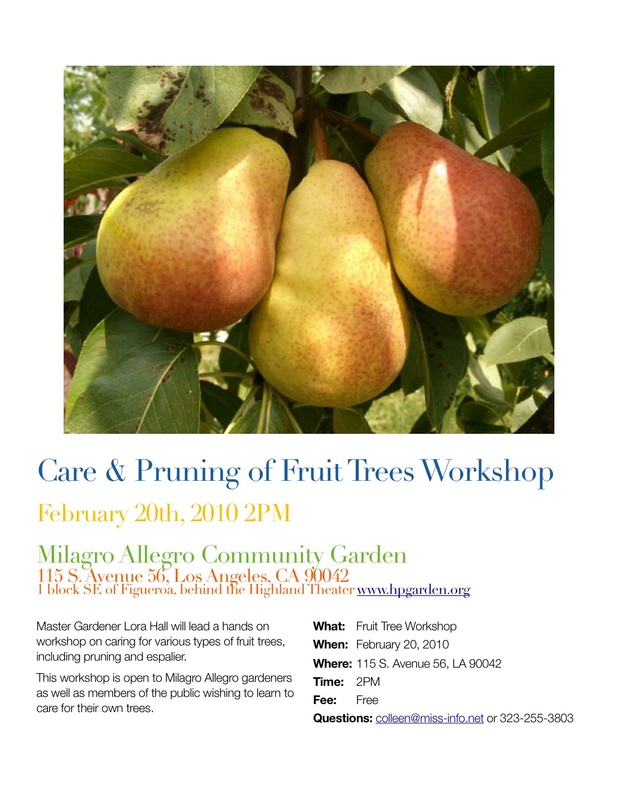 Los Angeles Urban Farmers Unite!